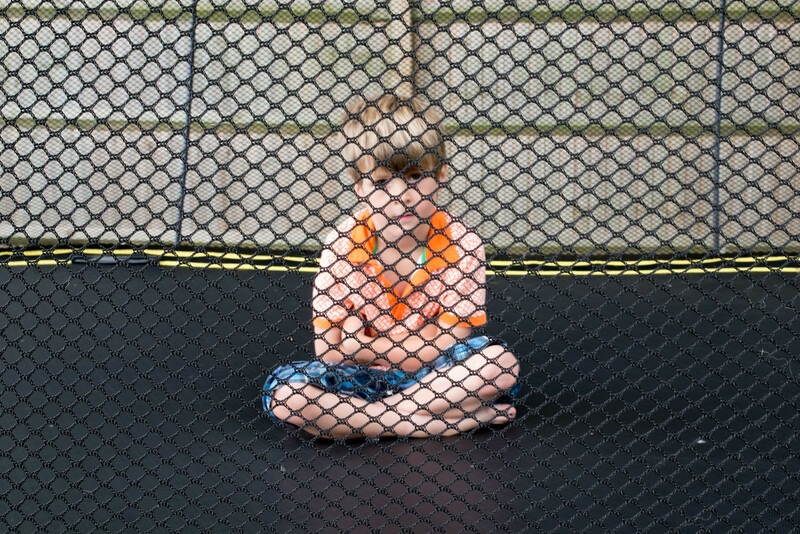 Generally any photo you take of a child on a trampoline will tend to overexpose because a good chunk of the image will contain the black matting or safety net. When the camera takes a general reading of light in the picture, it will brighten the whole image to compensate for this area of darkness. The best way to avoid this is to set your exposure manually by taking a reading using your hand, but if you would rather use automatic or semi-automatic mode you can use exposure compensation to reduce the automatic exposure levels. Press the button and dial down to -1.0 to ensure the image comes out a stop darker than the camera thinks it should be. 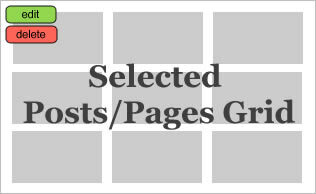 It is far better to underexpose an image and correct it in post-processing than to blow out (or over-expose) areas of a picture which are then harder to retrieve detail in. 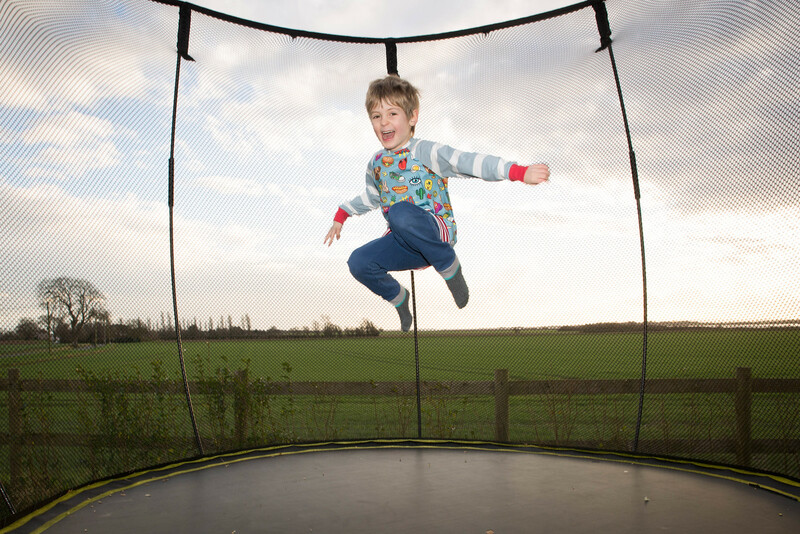 If you are taking photos of young children on a trampoline most of the time your view of them is going to be obscured by a safety net. 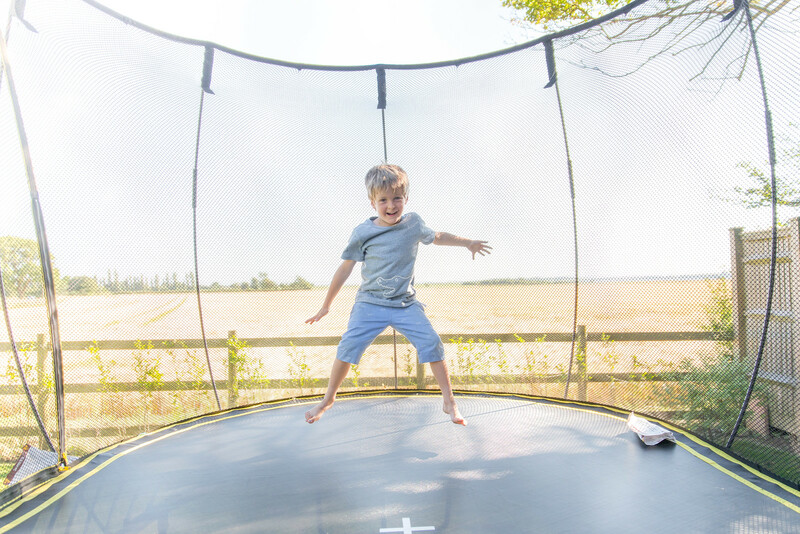 There are two ways to get round this, either you can unzip the net slightly and position yourself at the entrance to the trampoline with your body blocking the gap you have created or you can take photos through the net! This sounds like a crazy idea, but I promise you it’s possible. This is a technique I first learned for taking photos of animals in a zoo where your view is blocked by a wire fence. First of all set you camera to the lowest aperture on your camera. My 24-70 lens will open up as wide as f/2.8 which is just about wide enough to do this trick, but a wider aperture of between f/2.0 and f/1.4 would be preferable. Then place the camera lens so it is touching the net, use single point focus and place the focus point over the child making sure to focus on them and not the net. Sometimes using the trampoline net can produce interesting effects. 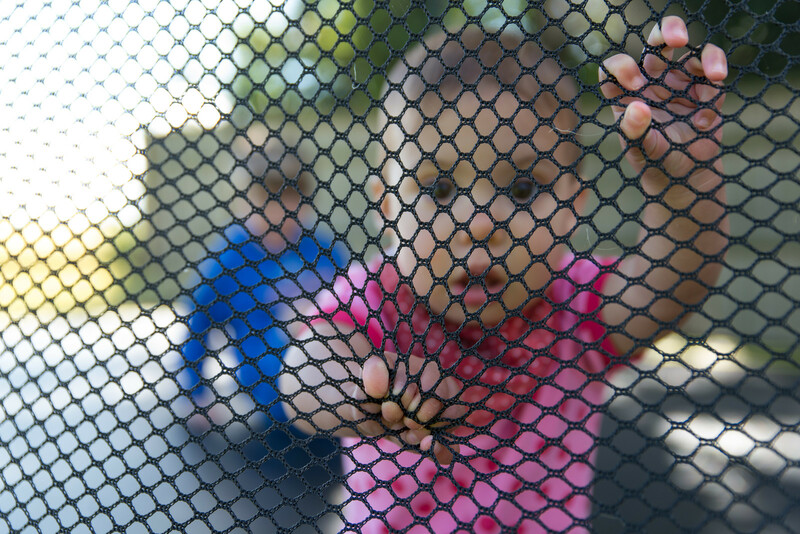 For the photo below I positioned myself so that Alice’s eyes lined up exactly with the holes in the net, picked a shallow aperture and shot a few inches back so the net and her hands are in focus and she’s not. It’s an unusual image, but it’s also one of my favourite trampoline pictures I’ve taken so far. If your camera is set up correctly you should be firing off a lot of photos in a short space of time and discarding most of them. Kids on trampolines pull a lot of weird faces and a lot of weird poses and even the best photographer in the world won’t be able to anticipate the exact second to press the shutter button, so you have to take lots and be prepared to reject nearly all of them. Binning photos does not make you a bad photographer, it makes you a selective one. Of course this rule applies to all photography, but it’s still always worth mentioning. The difference between an average photo and a really great photo is more often than not, light. When you are shooting outside that usually means sunlight. Both the photos above were taken during the late afternoon when the sun was low in the sky. The top one was taken on my sister’s trampoline which her teenagers use and the lower one on our Springfree which has a safety net. Shooting into the son is a tricky thing to master and if you are not quite ready to switch to manual, you can do a lot in post-processing if you shoot in RAW and use software like Adobe Lightroom. 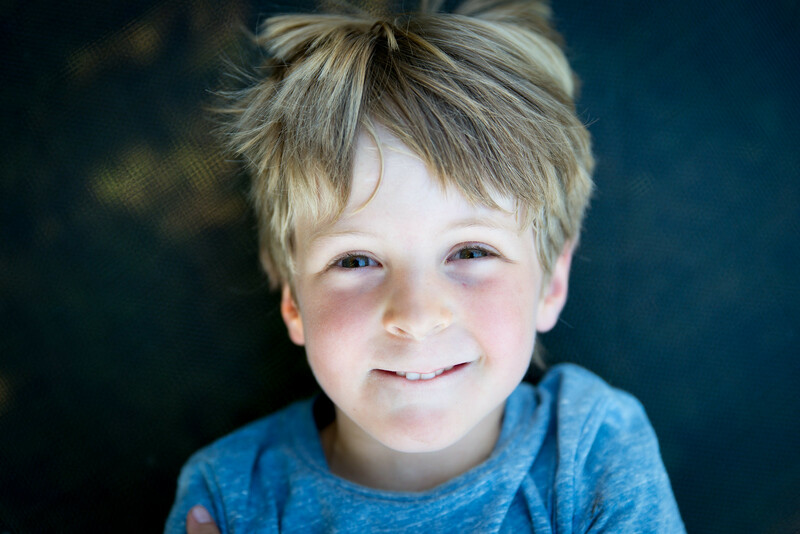 The children of keen photographers usually get pretty tired of having their photo taken, but being given instructions of the trampoline is an entirely different thing. 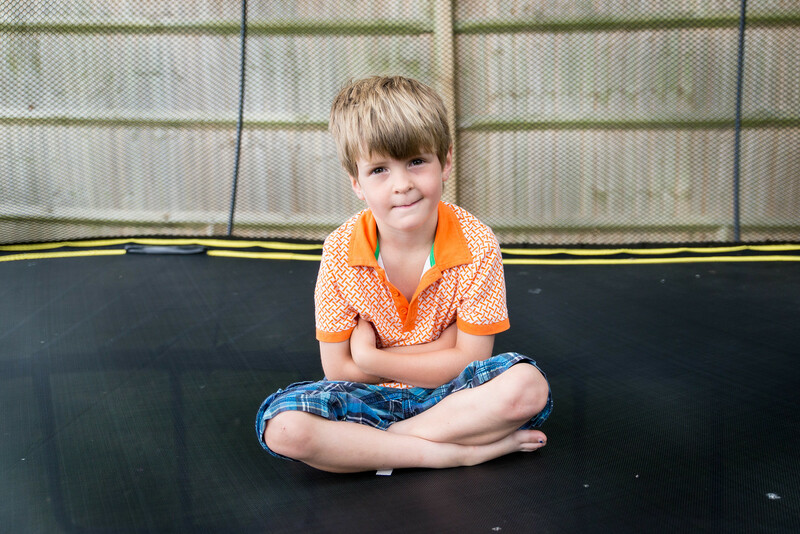 Tell them where on the trampoline mat you want to jump and give them challenges like “try and lift your knees up to your chest” or “make a star shape”. Kids love a game and having adults involved in their playtime, so you’ll find they will humour your photo taking for longer. 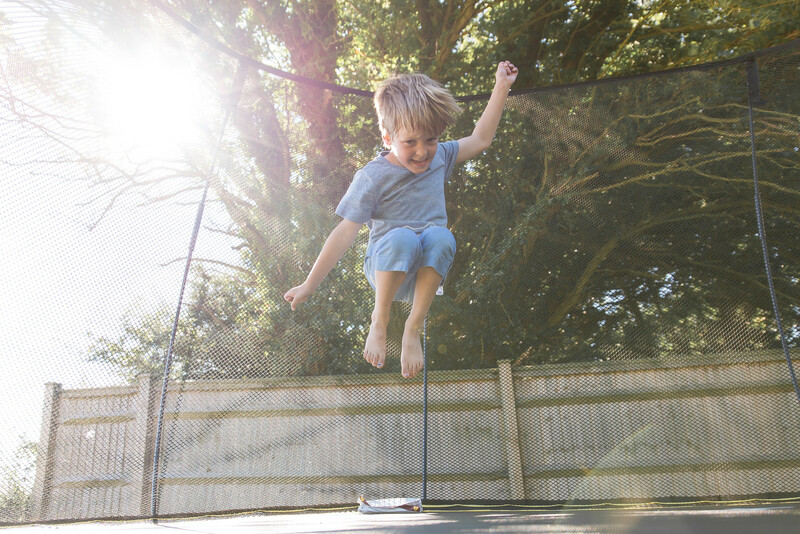 Trampoline photos don’t have to be all about bouncing, between those high energy moments get your kids to lie down on the mat and stand over them and take some head and shoulders shots. Move the focus point to the eye and open the aperture wide. If you are using Lightroom for post-processing drag the blacks down to ensure a punchy high contrast image. 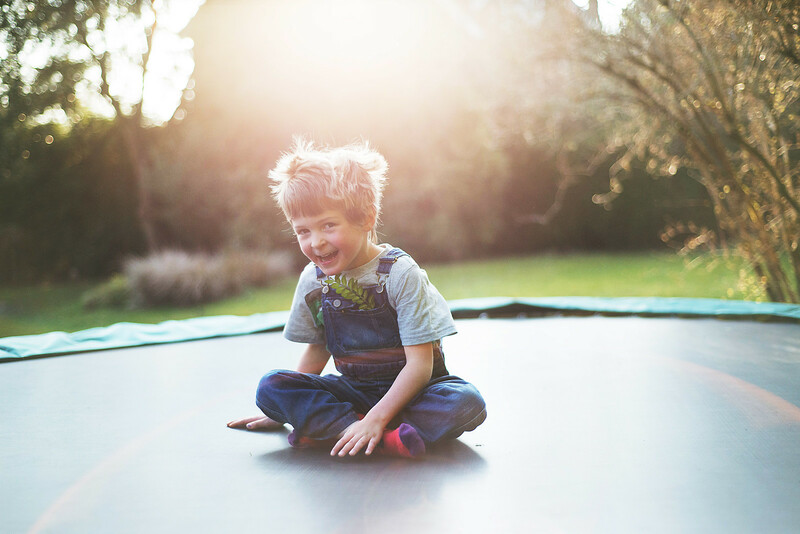 This post is written in association with Springfree Trampolines UK whom we are working with this summer.